Easily the runaway winner in the combined score for most interesting book name and coolest author name! 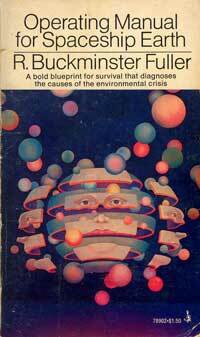 This is one of the original environmentalism books. Fuller was writing about being green long before it was the color du jour. Fuller is the originator of the geodesic domes, Buckey balls were named after him, he was the 2nd President of Mensa (thanks wikipedia), and the man wore 3 watches (one for the past, present and future time zones he would visit). First off, I have to state that Fuller is clearly a man well before his time. Many of his ideas in this essay published in 1969 are just now being taken seriously. However, the essay itself is terribly written. Not to sound like the grammar Nazi, but did the man ever hear of a transition sentence? Essentially, what you have here, is a chalkboard of Fuller's ideas. You have to wade through a lot of much to get to the gold, but that shouldn't diminish those ideas. In the essay, Fuller envisions Earth as a spaceship of finite resources, most of which we cannot resupply on the human scale. As such, he argues for what is basically sustainable development, use of secondary energy sources such as wind, sun, and tidal energy, as well as arguing for worldwide cooperation. Much as Asimov has done in science-fiction, Fuller envisions a world in the not so distant future where state boundaries have been rendered obsolete. In such a world, populations can work synergistically towards sustainability. Possession is becoming progressively burdensome and wasteful and therefore obsolete.